and then again, this time in Copic 0.1 mm gray ink with Derwent Graphitint watercolor pencil overtop. Because what drew me to this photo so strongly was the expression on her dog, Hubble’s face. And I wanted to focus much more on it. My goodness. Such emotion! Animals know so much more than we give them credit for. And they can be much more intuitive than humans. I want to thank you, Meg, for inspiring me with your lovely photo. This one really knocked my socks off. Peace, wags and whiskers to us all! Enjoy your Wednesday. Little fellow. I want to give him a big hug and a pat. Thanks Kerfe. Very hard to resist this one. I’m glad I couldn’t. Thanks, John. Really a poignant moment there, I just had to try and capture. Thanks, Rebecca. So much to be read from his eyes and head. So glad you enjoyed it. Such expression in this sweetie you captured. I want to hug him. Great job Laura! Thanks Jodi. A good reference photo is so key. Who could resist that look? It’s the eyes, you caught the right expression, nicely done Laura. Thanks so much, Sharon! I’m so glad you think so. I was happier with the brown one in the eyes and nose. It was nice to do them both. Love that photo! Hubble is amazing! 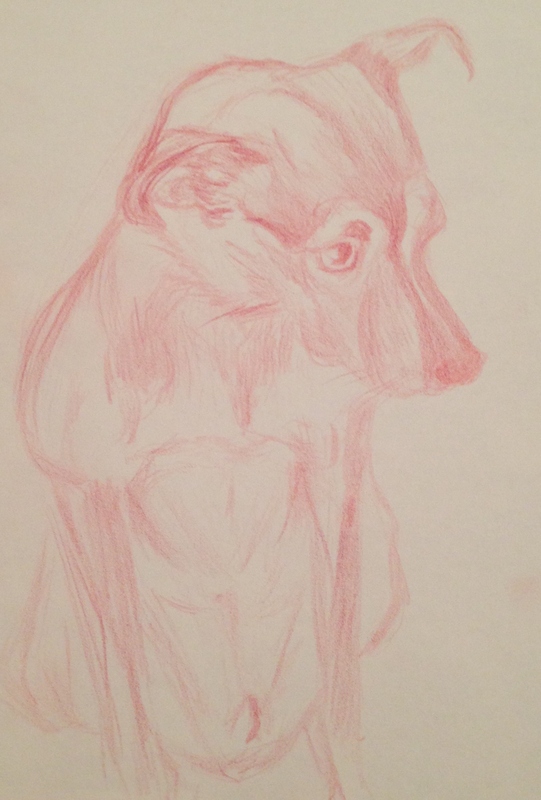 Such a beautiful dog and such awesome sketches of him, Laura! ❤️😃 I agree…dogs know much more than we give them credit for! I think all animals do, but personally, I feel it’s easier to read a dog I don’t know. I could always read my cats perfectly well, but I can’t read just any cat. Most dogs I think are easy to read, even strange ones. Thanks Charlie, I’m so glad you like him! You’ve really captured a sense of grief there, Laura – very moving. Thanks, Michael. I know you appreciated the photo as well. Very hard to resist that when I’m so focused on faces. Just had to try & capture it. I’m so glad you like it. Aww, you totally captured that sorrowful look. So sweet. Thanks so much, Teri. What a gorgeous face on this sweet dog. So glad you liked it. That is an emotion image. Good job capturing that look, Laura. Thanks, Kirk. I really could not resist that photo for more than a couple of minutes. It pulled me that strongly. What a cutie! You captured the emotion. Makes you want to give him a hug! Yeah i agree with Jodi, you captured exact expressions in this 🙂 Cute Doggie and sketch too! Thank you Snehal, so glad you like it! I just couldn’t not draw this sweet animal. Sweet! 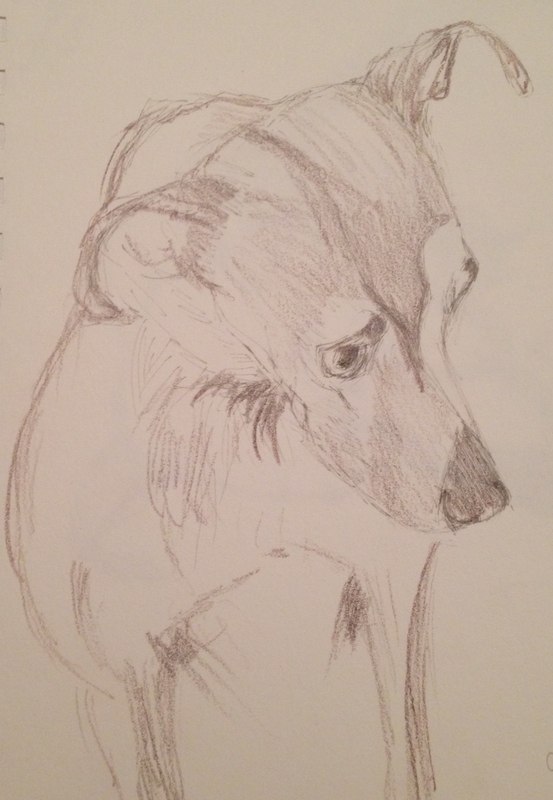 Laura you captured the essence of the dog, his expression beautifully. Thanks so much, Jennifer. It was impossible to resist this one. So glad you like it! so moving, the first one you did is so spontaneous and great! Thanks, Arvind! Usually the first one is like that for me. I do like the eye and nose better in the second one, but the body in the first. I’m so glad you were moved, and I really appreciate your comment! The little dogs expression speaks volumes. Well done Laura! I feel that Hugs are needed. I agree, Susan. Big hugs!! I’m so glad you enjoyed the sketches! Thanks so much, Jill! I could draw this again and again…..it pulled me in so hard. So glad you liked it! The eyes have it…very natural. Thanks, Nexi. Oh, who could resist this face? Wow. So sweet and tender. Really glad you enjoyed it. drawing him. What a precious face. Thank you so kindly, Connie! I really appreciate your encouraging words! Oh what a FACE! such a sweetie. Thanks, Rachel! I couldn’t resist him for a minute! Love it when an image inspires you to draw right away! He’s a cutie! Thanks so much, Teresa! So glad you enjoyed it! Thanks, Victoria! I’m so glad you enjoyed it. When an image grabs me like this, I just hope it turns out to be something I can post, because there is so much emotion inside me & in the image to express. Such a wonderful rendering. Animals can be so expressive. I sometimes think more so because they can’t speak. That’s a great observation, Suzink, and thanks for stopping by and commenting on this one. I love when an image grabs me this hard and won’t let go. So glad you enjoyed it! Animals have so much to teach us if we just open our eyes and ears. Both are excellent, but my favorite is the 2nd one. He’s so sweet! Thanks for your vote, Deborah! That’s my favorite too. That face! Couldn’t resist. Glad you enjoyed it! Aww thank you, Margaret! That’s so kind! So glad you enjoyed it!